The essential settings for your web registration form are covered in our Help article Web Reg Form: Settings. When you are ready to dig a little deeper have a look through these advanced settings to further customize your form. On your Web Registration Form you have the ability to re-label most of the Text Box labels and decide which fields are hidden. You can also specify if an answer is required or optional. Re-label any fields you'd like to. For example, perhaps you want to relabel the "Student Transportation" field to "How is child being picked up?". 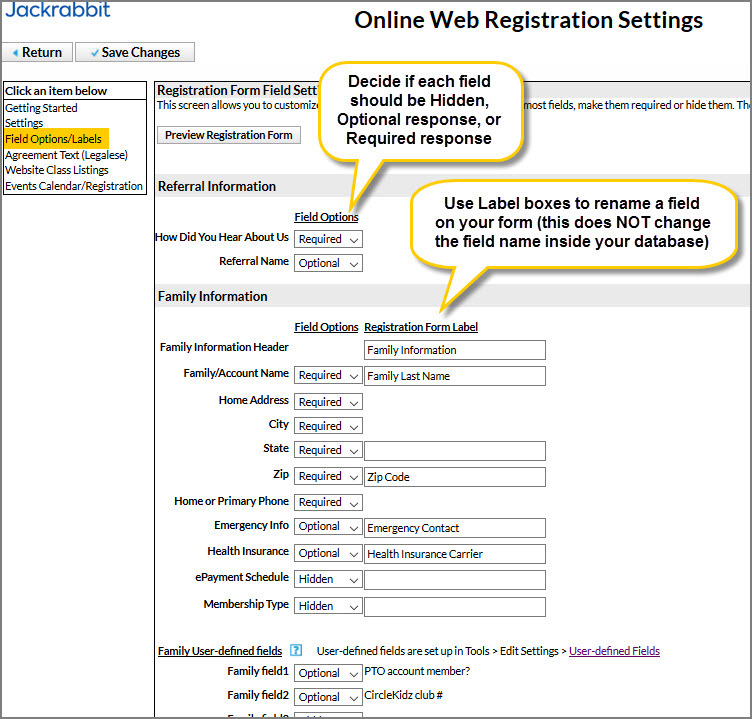 The custom labels you edit here only changes what is shown on the Registration Form to the parent. It does NOT change the field label inside the database. Decide if you want each field to be Hidden (so that it doesn't show at all inside the Registration Form), or Optional (it shows but the parent can leave it blank) or Required (parent must provide a response). Custom User-defined fields (5 per family, and 5 per student) can also appear on your Registration Form. These are set up under Tools > Edit Settings > User-defined Fields. They can be used to gather specific information that your organization deems necessary, such as coupon redemption information, costume sizes, past skill achievement, special requests, or any other data or short Q&A that you would like to capture during registration. You can make these fields hidden, optional or required. Values entered by the customer are recorded and included on Email confirmations. Values entered on a Family User Defined field will be saved/shown on the Family Misc tab. Values entered on a Student User Defined field will be saved/shown on the Student Misc tab. The responses also show up on several searches and reports throughout Jackrabbit.